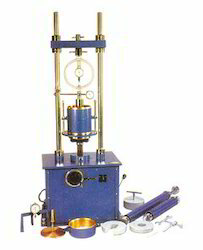 Our range of products include laboratory cbr test apparatus and california bearing ratio test apparatus. By keeping track with the market development, we are offering optimum quality Laboratory CBR Test Apparatus. The offered test apparatus is manufactured by making use of high grade material and leading technology in compliance with the set norms of industry. We offer this test apparatus on number of specifications as per the variegated needs of customers. 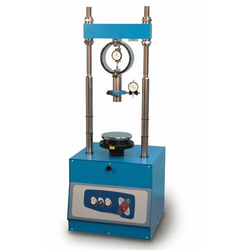 Our offered test apparatus is packed with quality material to enhance its life. With thorough knowledge of the industry, we are engaged in manufacturing, supplying and wholesaling California Bearing Ratio Test Apparatus. These frames are extensively used for determining the bearing value of highway sub-bases and sub grades. Also, our professionals employ advanced machines and utilize quality tested material to manufacture these frames. A team of experts keeps vigil at every stage of production, so as to maintain higher standards of quality. Also, our experts examine these load frame on different parameters to ensure their flawlessness and then forward for the end delivery. This apparatus is used for determining the bearing ratio and expansion characteristic of base, sub base sub grade soil for design purpose of roads, runways and pavment. Our CBR apparatus is powder coated and available in 2 3 Speed with MSmould , proving ring 5000 Kilo Newton Dial gauge for above 0.01 * 25mm. shreeji instruments .